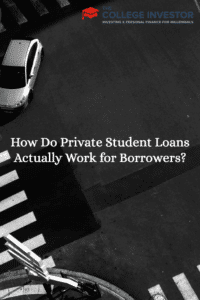 Home » How Do Private Student Loans Actually Work for Borrowers? Private students loans are the primary way that student loan borrowers get into trouble. Hands down. The reason is that the Federal government has limits on the amount that you can borrow for Federal student loans. And there is a reason for those limits — so that you don’t get in debt over your head. However, some people just don’t learn. They think, Hey, I need more money for school, let’s go see where else I can get it. And banks are happy to lend for student loans — because they must be repaid. Always. In some cases, there are very valid reasons to get private student loans. Say you want to be a doctor, and you need $200,000 for medical school. That could be an exception to the rule about getting private student loans, because your income as a doctor will easily cover the student loan payments. Let’s look at how private student loans work to give you a better idea of why they aren’t the best loans. Private student loans are more like car loans than student loans. I say this because, like a car loan, they have collateral required. Most students don’t realize it, but the collateral for student loans (especially private student loans) is your future income. When you get a private student loan, you’re telling the bank that if you don’t pay it back, they can garnish your wages and income to get their money. That’s why it’s like a car loan. Also, unlike most Federal student loans, most private student loans require a cosigner. Cosigning loans is a bad idea, especially cosigning student loans. The reason is that it puts the cosigner’s income on the line as much as the student’s. Second, many private student loans are variable rate loans now, meaning the interest rate on the loan could rise as interest rates rise. This is good for banks, but bad for students. You could take out a student loan at one interest rate as a freshman and soon be paying a much higher interest rate when you graduate four years later. Almost all Federal student loans have fixed rates on them, so you know what you’re going to pay. Let’s compare private student loans to Federal Direct student loans for students looking to get a loan for the fall of 2018. Right now, the interest rate on a Federal Direct loan (both subsidized and unsubsidized) is fixed at 4.45% (check out the best student loan rates here). The lowest interest rate I could find for a similar loan (that has deferment during school and six months after) for undergraduates is 5.99%. That is substantially higher. Furthermore, there are a lot of student loan forgiveness programs and student loan deferment options for Federal student loans, and very few for private student loans. Don’t get private student loans unless you have a true need — like medical school. Otherwise, look for alternatives to lower the costs of school, such as financial aid, or even going to a cheaper university. If you need to get private student loans, make sure you check out our list of the best private student loans to pay for school. What are your thoughts on private student loans?